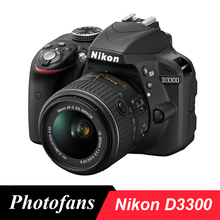 The black D3300 DSLR Camera is a compact and versatile camera featuring a DX-format 24.2 megapixel CMOS sensor and EXPEED 4 image processor. The sensor and processor combine to realize high-resolution imaging, notable low-light sensitivity to an expandable ISO 25600, continuous shooting to 5 fps, and Full HD 1080p video recording capabilities. Additionally, the sensor design omits the traditional optical low-pass filter in order to gain the utmost sharpness and resolution from both photos and videos. These imaging assets are complemented by an 11-point autofocus system, which provides quick and accurate focusing capabilities to suit working with a variety of subject types in nearly any lighting situation. A range of shooting modes and features are also available to help creatively accentuating your imagery, including an Easy Panorama mode as well as Picture Control settings for in-camera adjustment of the color and contrast qualities of your photos and movies. For live view monitoring, image playback, and menu navigation, a large 3.0″ 921k-dot LCD monitor is available and features a wide 160° viewing angle to better support working from high and low angles. Also enhancing the viewing and shooting abilities of the D3300, the optional WU-1a Wireless Mobile Adapter can be used to provide Wi-Fi connectivity for wirelessly transferring imagery and remotely controlling the camera from a linked Android or iOS mobile device. The 24.2 megapixel DX-format CMOS sensor and EXPEED 4 processor work together to produce overall high image quality with notable detail, dynamic range, color accuracy, and low-light sensitivity to a native ISO 12800, which is further expandable to ISO 25600. Additionally, the sensor’s design omits an optical low-pass filter in order to acquire the greatest amount sharpness and detail from subjects. The EXPEED 4 processor also enables a wealth of speed throughout the camera system, including support for Full HD 1080p movie recording and a full-resolution continuous shooting rate of 5 fps. Full HD 1920 x 1080p movie recording is supported in multiple frame rates up to 60 fps, as well as HD 720p and SD 480p in multiple frame rates, in the MPEG-4 AVC/H.264 format. During recording, full-time autofocus can be employed, with face-detection and subject-tracking capabilities, for ensured sharpness with a wide variety of subject types. A built-in monaural microphone can be used to record high-quality sound or, alternatively, a microphone input is integrated into the body design to support the use of an external microphone for enhanced quality and control over audio recordings. The D3300 integrates a large 3.0″ 921k-dot vari-angle LCD monitor, which features a 160° viewing angle to better support viewing capabilities from high and low working angles. Alternatively, a bright pentamirror optical viewfinder is also integrated into the design for precise eye-level viewing and real-time monitoring of subjects. A built-in pop-up flash is also available for additional illumination when working in low-light conditions and supports Nikon’s i-TTL flash metering system. A hot shoe can be used, too, for connection and optional external flash for even greater lighting control. The optional WU-1a Wireless Mobile Adapter can be used to provide Wi-Fi connectivity for instantly transferring imagery and remotely viewing a live view image from a linked mobile device. Scene Modes: Auto, Auto (Flash Off), Portrait, Landscape, Child, Sports, Close up, and Night Portrait. In-Camera Image Editing features: D-Lighting, Red-eye correction, Trim, Monochrome, Filter effects, Color balance, Resize, Image overlay, NEF (RAW) processing, Quick retouch, Straighten, Distortion control, Fisheye, Color outline, Perspective control, Color sketch, Miniature effect, Photo illustration, and Selective Color. Language support: Arabic, Bengali, Chinese (Simplified and Traditional), Czech, Danish, Dutch, English, Finnish, French, German, Greek, Hindi, Hungarian, Indonesian, Italian, Japanese, Korean, Norwegian, Persian, Polish, Portuguese (European and Brazilian), Romanian, Russian, Spanish, Swedish, Tamil, Thai, Turkish, Ukrainian, Vietnamese, Marathi, and Telugu.